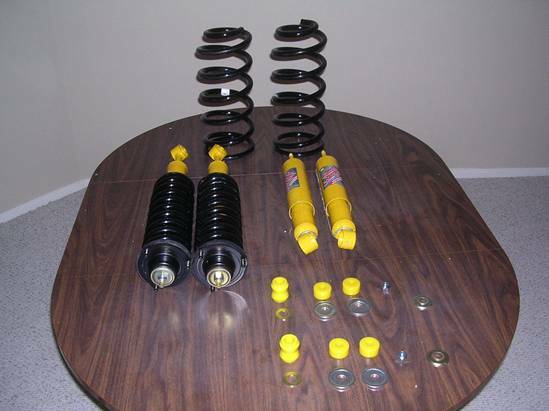 NOTE: The springs were compressed and assembled with the shocks and the top plate at SLEE Off Road. This enabled me to avoid having to do this task myself (compressing springs can be difficult and requires special tools). Total installation time: 8hours front and rear. Put Car on Jack Stands, Remove Rear Wheels. 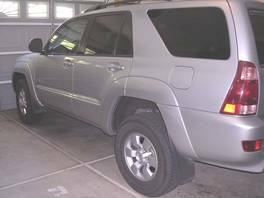 Support the rear axle housing. 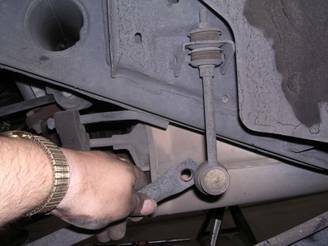 Remove Shock Absorber bottom bolt on LH and RH side of vehicle. 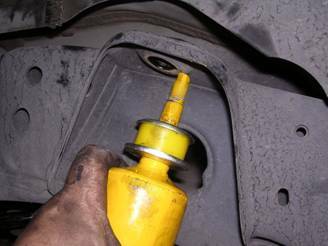 Remove the nut, cushion retainers, cushions, and shock absorber on LH and RH side of vehicle. 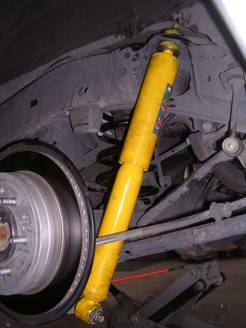 Hint: I used a pipe wrench to keep the shock from turning when un-tightening. A strap wrench might be a better choice as it will leave no teeth marks. 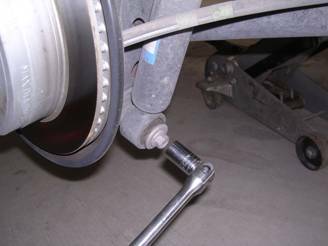 Remove rear stabilizer link by removing the nut and disconnecting the link from the stabilizer bar on LH and RH side of vehicle. 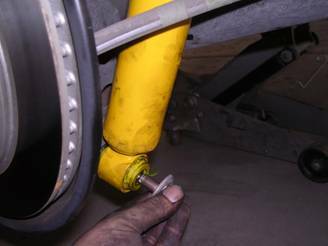 Start to lower the rear axle, be careful of the brake lines. Install the new coil springs. Re-assemble the stabilizer link. Torque:52 ft lb. 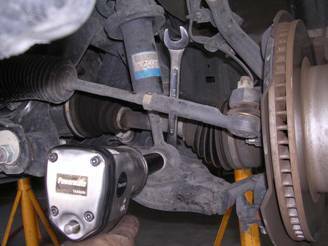 Install the new shock absorbers, the nut, cushion retainers, cushions, on LH and RH side of vehicle. 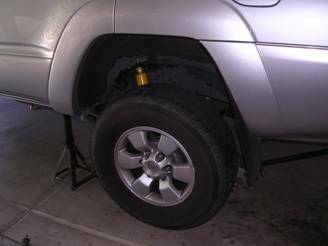 Put Car on Jack Stands, Remove Front Wheels. 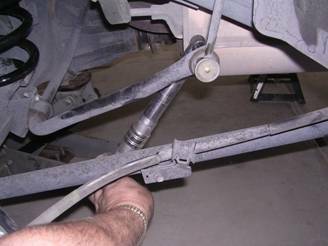 Remove the nut and disconnect the stabilizer link from the steering knuckle. 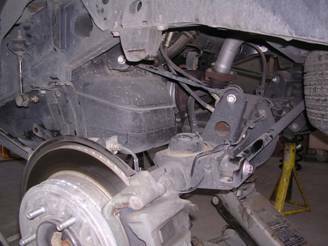 Remove the front stabilizer brackets. Hint: The front of the bracket has a slotted hole. Remove the bolt on the back of the bracket on the RH and LH side, and then just loosen the front bolt on the bracket on RH and LH side. 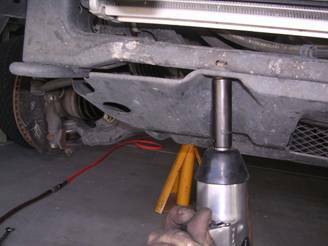 Now you can slide the brackets back and remove the stabilizer bar. 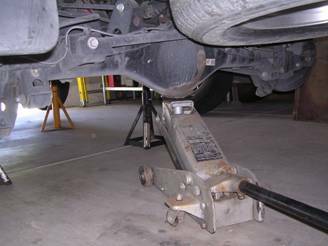 If you take the front bolts out all the way, the stabilizer bar is unsupported when you take out the last bolt making the job more difficult. 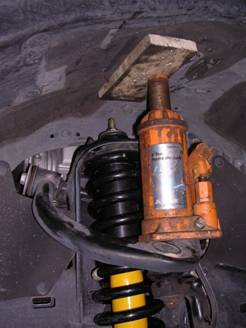 Remove the lower bolt on the front shock absorber and coil spring assembly on LH and RH side of vehicle. 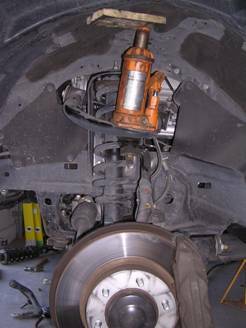 Remove the 3 nuts on the top of the front shock absorber and coil spring assembly on LH and RH side of vehicle. 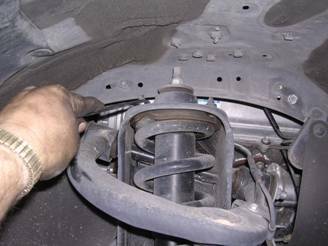 Remove the front shock absorber and coil spring assembly. 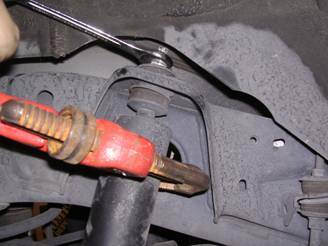 HINT1: You can use a jack to apply downward pressure on the a-arm making it easier to remove the shock absorber and coil spring assembly. 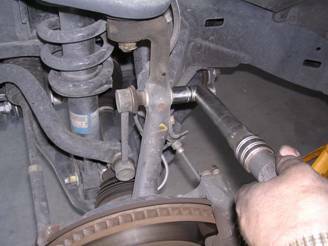 HINT2: to make this job easier you can remove the tie rod. I did not do this. 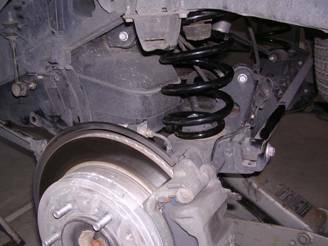 Install the new shock absorber and coil spring assembly. 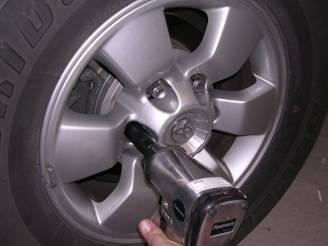 HINT: You can use a jack to apply downward pressure on the a-arm making it easier to install the shock absorber and coil spring assembly. 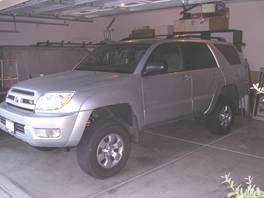 The truck feels very similar to stock over the course of a 3 mile city street test drive. No additional data available.